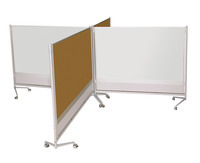 Best-Rite DOC Partition enables to divide, organize and customize a work or display area with porcelain steel marker board surface on both sides. DOC Partition measuring 6 in x 6 in is able to divide space by connecting and arranging them together that includes slat panel at the bottom to hold accessory trays. Partition features an anodized aluminium trim with locking casters for easy mobility and stability.